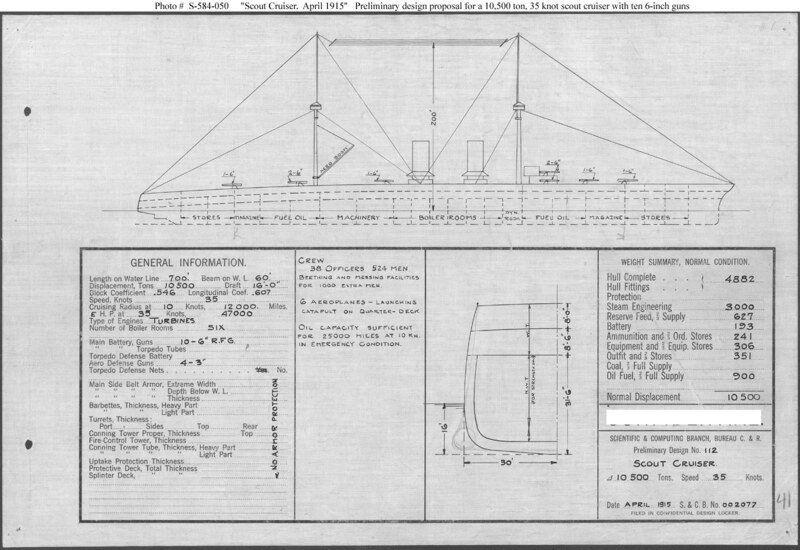 This plan provides ten 6-inch guns and a speed of 35 knots in a ship 700 feet long on the load water line, 60 feet in beam, with a normal displacement of 10,500 tons. This concept initially was laid out in February 1915 in Plan # 001970, located in the Preliminary Design # 112 Design Book at the National Archives. Design # 112 was developed in some detail by a Mr. Cook, a Navy civilian designer, and was the baseline for a series of 22 subsequent preliminary designs that systematically explored the tradeoffs in shifting emphasis among armament, protection, and speed in large scout cruisers intended for transoceanic operations. Ultimately, however, no ships of this type were built.